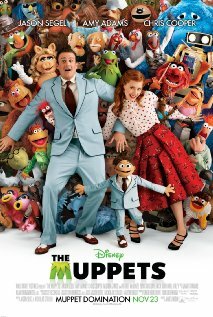 The other day I took the kids to see The Muppets. I think I smiled through the entire movie! I loved that I recognized characters and songs that they sang. What I loved the most was when they performed like they used to on the original show. It reminded me of SNL actually just more of a kid friendly version! Even my 16 year old enjoyed it! The little ones were delighted, the dog was confused, and A was no where to be seen! (Jackson wasn't home or he probably would have been rolling his eyes!) Our favorite song was "Mahna Mahna". We played it over and over and laughed so hard! Our next favorite was "Life's a Happy Song". Somewhere along the line our dancing and singing turned into running and being crazy and then someone gets hurt and cries, but let's dwell on the happy parts! :) Sometimes it's just fun to dance and act a little crazy! Can you tell the ham of the family is?? Wonder who he takes after?? ?